This is a limited edition lithograph print on paper from famed Disney artist Bill Justice. The print is hand-signed by the artist and numbered. 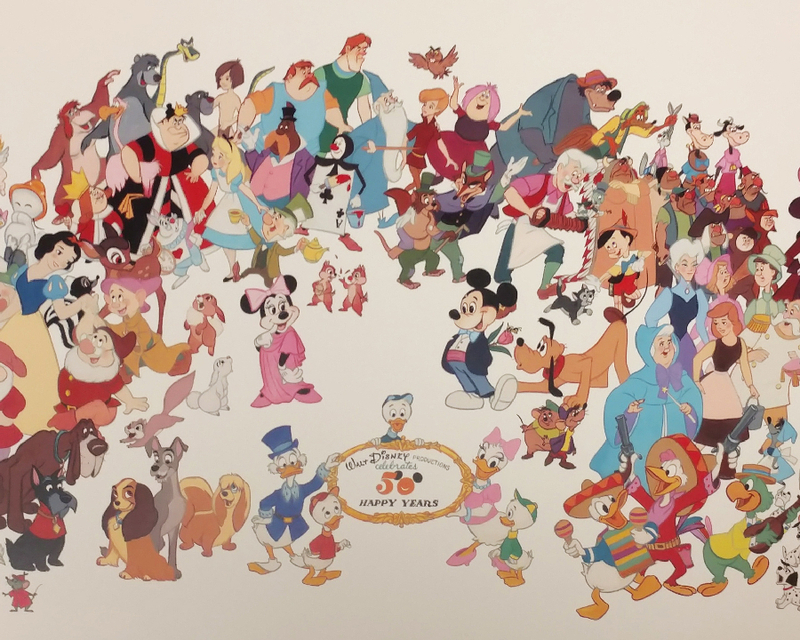 The print is titled, "Walt Disney Productions Celebrates 50 Happy Years", and was sold exclusively to Walt Disney Productions Cast Members. There were only 1200 of these prints made available (the number shown in the image is a stock photo and your number may differ than what is pictured). The print measures about 16" x 40" overall and the image area is about 11.75" x 38". The Image depicted in the print is of the mural Bill Justice originally designed in 1973 for the inside of the Walt Disney theater on Main Street USA, in the Magic Kingdom at Walt Disney World, and this print was recreated from his original art, in the 1990s.